Ties are a key part of your outfit. It means a lot, and we will look through why it makes such a difference. We looked at Pocket Squares, Cufflinks, Belts, Socks which are great accessories to add to your outfit, now we are getting in the core of your business look. First of all, looking at a tie it will be more or less an arrow shaped piece of fabric pointing towards your face, right in the center of it actually. So we are talking about something that is right below what people are most likely looking at and is pointing at it. When you look at someone, looking at them in the eye is key. You want them to make eye contact as well. The ties will help you do just that, and without you knowing it. Lately, there is an epidemic of people not wanting to wear ties. Even some French politicians are not wearing ties when sitting in the Parliament. From the country of fashion… I’m sorry but that’s an outrage. Ok, maybe not an outrage. But you can skip wearing a tie after a few meetings with your clients when you get a little more familiar with one another. And also if you see that THEY are not wearing ties. Ties come in all shapes, colors, patterns. That gives you a lot of choices to express yourself. Alright, that has to be exciting. Not so much actually. Let’s start with Colors. The best example for you to look at are politicians. From George W. Bush, Barack Obama, Donald Trump, US Presidents try to favor solid color or subdued pattern when it comes to their tie. And depending on the message they are trying to convey, they will wear a tie with different color. Red is your Power Tie, it means that you are here to put your foot down and you mean business. Darker reds, such as a burgundy, can help build trust, while lighter red and pink ties can be more of a statement about your personal style and be associated with creativity. Blue is more of the all-purpose tie hue. 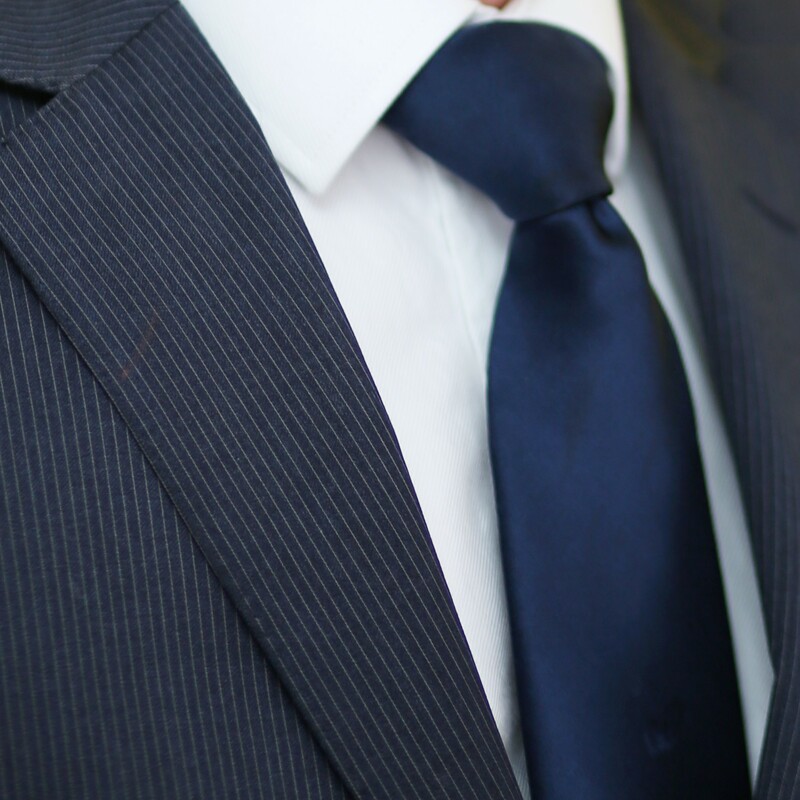 Blue ties are a good investment because the colour reminds people of the sky and ocean, which has a calming effect. I personally have a large collection of blues with many different hues and patterns. As it pretty much goes with all types of suits and won’t clash. This is where it hits. Shapes, there are mostly two that people consider. Normal or Skinny. Now let’s look at something simple. The width of your tie has to be roughly the width of the lapel of your jacket. The width of your tie has to be therefore proportional to your body shape. Ok, so if you are not shopping at some ultra trendy suit shop from Europe, and you are playing in an alternative rock band, let’s say the skinny tie is out of the question. We will then focus on the regular tie, between 2.5″ wide for slender people to 3″ for more hefty builds. And those come in different lengths. Let’s make it simple. If you are 6’0″ and your neck size is under 19, get regular length. On the other hand if you are 6’3″ and your neck size is 16, then go for extra length. These can make it or break it. As a general rule of thumb, I will advise you to go with something subdued. Like something, solid, striped, geometric, even a nice tone on tone paisley. Nothing too bright, contrasty or even with a “cute pattern”. Here we go, the “cute pattern tie”, the Ugly Christmas Sweater of ties. Sometimes a significant other gets it for you, maybe a family member… Anyway, do not wear it, EVER… It’s not cute, never really been cute, and don’t think it will ever be cute. At least not for a business meeting. Do I sound boring, maybe, but the image you are trying to convey is serious, trustworthy and that’s it. Now if like me you wear patterned suits, pin stripes, windowpane, try to focus on solid ties, so the patterns do not clash. You can wear a tie bar or clip if you feel like it, but keep in mind that you don’t want to “overcrowd” your jacket, with a pocket square, a lapel flower or insignia – One is fine, two is pushing it, and three you are definitely over the limit. Now if you choose to go for a tie clip, something subdued, with no special meaning is something that will go along just fine. Knowing how to tie your tie could be an art. When in business school, I often found myself tying classmates ties, because they had no idea how to do it. My father taught me the “four in hand” knot when I was around eight years old. Now, in 2018, you have more than a dad or a classmate to help you tie your tie. You can find Youtube tutorials to help you how to learn to tie different knots. This is very easy, and you will need video assistance a few times, not more, then it will be hardwired in your brain. Would recommend two knots. The Four in Hand for classic or narrow shirt collars, it is easy to tie, and it is the most used in the Western Hemisphere. The Windsor, could be half or full (I use a full Windsor knot), perfect for semi spread or spread collars, it’s a larger knot that is symmetrical. Remember to adapt the tie knot you wear to the type of collar on your shirt. Also, something to consider is, when you are wearing a tie, you HAVE to wear a jacket. There is one exception to this rule, if you are six years old and you are ring bearer at a wedding. As you probably do not fit in that condition, put your jacket back on. This is especially relevant in business settings.